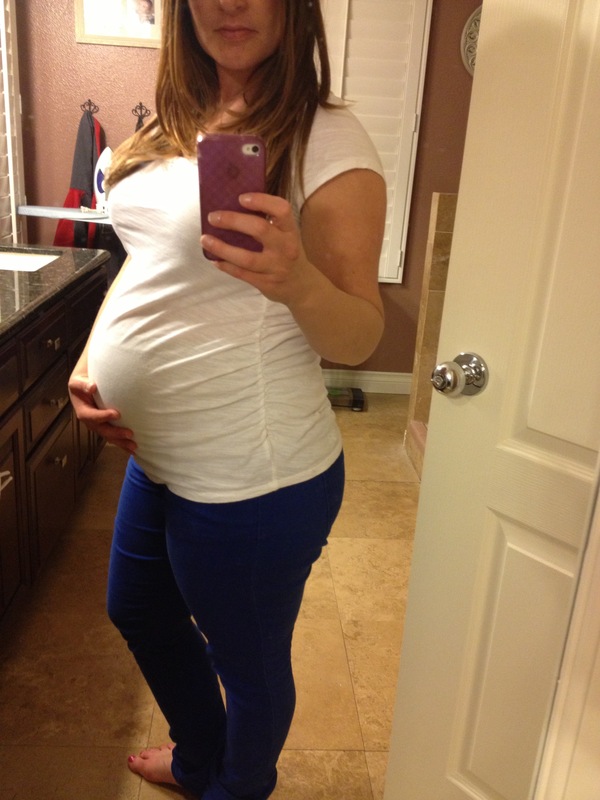 Favorite Maternity clothes this week? Spandex as always but since the weather has warmed up a bit I have been wearing more bright colors and even peep toe flats vs. regular close-toed flats. But once again, as the week went on, I had to pull the boots back out of the closet because we got rain. Typical March weather, one day its beautiful, mid-70’s and a few days later its cold and rainy. How’s your Sleep? Starting to get harder since I’m getting so much movement from baby girl, which makes me feel nauseas. Once I fall asleep I am tossing and turning because its hard to get comfortable or I have restless leg syndrome. Usually drinking a large glass of water before bed helps with circulation but then I end up getting up a few times in the night to use the bathroom. Its a never ending cycle thats only going to get worse as I get closer to the due date. Favorite moment this week? Having one day off this week for me, while everyone else was working or at daycare I finally got to do a few things that I haven’t been able to do because it’s hard to get to during the week or even on the weekends when I’m spending time with the family. Having ‘me’ days are essential when you become a Mommy! Do you miss anything? While it’s usually wine, this week it was a nice cold beer since the weather was so beautiful… only a few more months till I can enjoy one! Anything making you Nauseas? Yes, baby girl’s movements since it feels like she is doing somersaults all day long. Its strange because I remember Bode doing a lot of kicking and punching but nothing like I’ve been feeling lately. Mood? Good, I think it’s the warm weather and this weekend we even change the clocks to have longer days – so excited!!! What are you looking forward to? Girls’ weekend in Carlsbad this weekend, probably the last one like this for a while since 3 out of the 4 of us are expecting our 2nd child. No big plans just lots of gossip and girly fun!